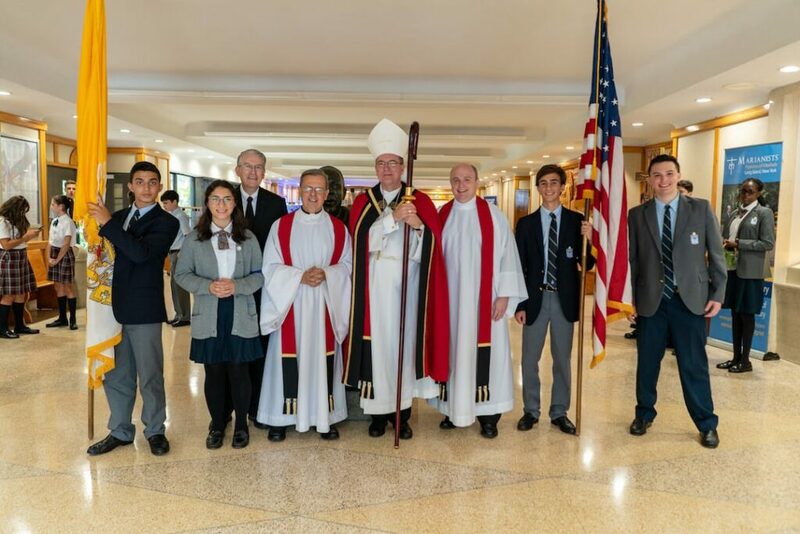 On the morning of Friday, September 14, Kellenberg Memorial High School welcomed Bishop John O. Barres, bishop of the Diocese of Rockville Centre, at the school’s annual celebration of the feast of the Triumph of the Cross. The prayer service was held at the foot of the 20-foot cross which faces the front entrance of Kellenberg Memorial. Gathered together for the prayer service were the students and faculty from Kellenberg Memorial High School, including members of the Bro. Joseph C. Fox Latin School, and the students of the nearby St. Martin de Porres Marianist School, the Marianist-run elementary and middle school in Uniondale. 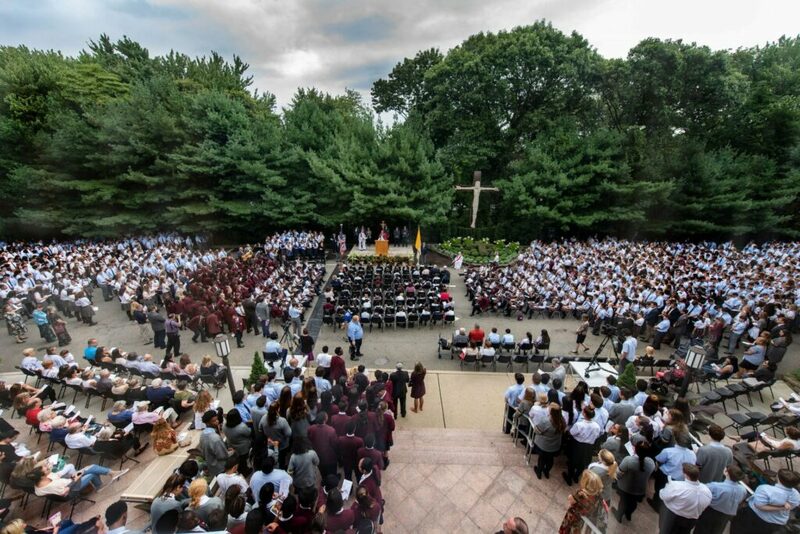 With over 3,000 gathered, including parents and alumni guests, the annual event is the largest Catholic school prayer service on Long Island. 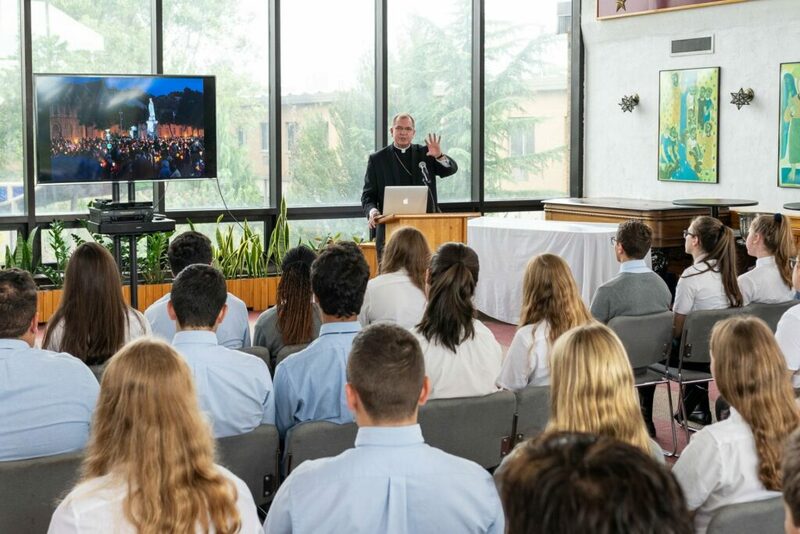 Following the conclusion of the prayer service, Bishop Barres continued his visit of Kellenberg Memorial, first meeting with seniors who participated in a mission trip to serve at the holy site of Lourdes, France this past summer. Joseph Tallini ’19 and Anya Murphy ’19 recalled their experience working with the elderly and infirm of Lourdes and serving the thousands of pilgrims who make their way to the grotto where Our Lady appeared to St. Bernadette 160 years ago. The bishop’s visit ended with a tour of Kellenberg Memorial High School including some of the newly renovated and updated classrooms and other areas of the building. 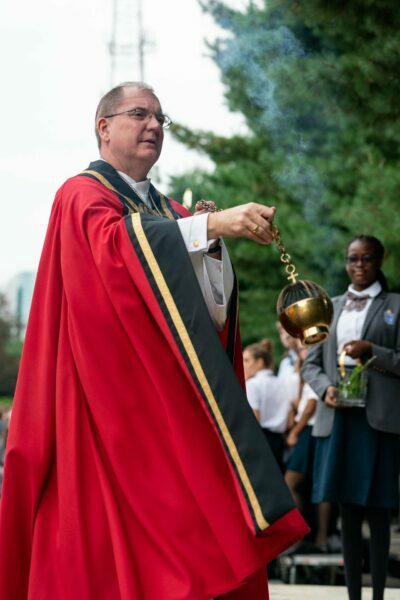 The Marianist community and the entire Kellenberg Memorial and St. Martin de Porres families extend their gratitude to Bishop Barres for taking time to visit the school and celebrate the Triumph of the Cross with the students.